'The Bachelor' contestant Corinne is not pleased that someone started a GoFundMe for her nanny. Anyone who is keeping up with this season of The Bachelor would probably agree that the person everyone is rooting for the most so far is contestant Corinne's nanny, Raquel. One fan is rooting for Raquel so hard that they started a GoFundMe to "free" her from working for Corinne. Needless to say, Corinne was none too pleased. 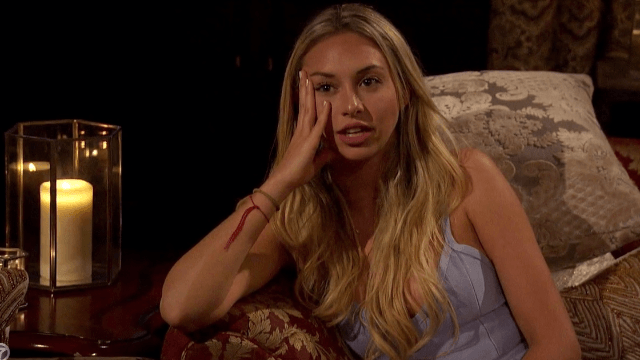 For those unfamiliar (though it is unfathomable to me that anyone could possibly resist watching The Bachelor), Corinne is 24 years old, labels herself a "serious businesswoman," and still has a nanny. Raquel, like, keeps my life together, OK? She makes sure that my bed is made every morning, makes my cucumber and my, like, vegetable slices for lunch. She makes me lemon salad. She knows exactly how much oil, lemon and garlic salt I like… I have tried so many times to make cheese pasta, and I can’t make cheese pasta like her. Aren't we all just trying to find someone who will make us cheese pasta? See, Miss Olympios comes from wealth and considers herself a “serious business owner”, she helps her daddy run their multi-million-dollar company while trying to juggle a pretty much non-existing modeling career. Raquel deserves better, we can only hope that she doesn’t already suffer from Stockholm syndrome from living under Miss Oympios. Let’s all help Raquel get a better job, to get back on her own two feet. Let’s help #FreeRaquel. Word of the GoFundMe page quickly spread amongst fans of The Bachelor, and soon reached Corinne herself. She was PISSED. Corinne posted about the page on Instagram, telling whoever created it to cut it out. So far, the GoFundMe has only reached $125 of it's $100,000 goal since it launched on Monday. But, if we're being honest, the hilarity of the situation is priceless. Regardless of whether or not Raquel is truly unhappy in her position as Corinne's nanny, there's no question that she's the hero of this season of The Bachelor. Honestly, I hope Nick picks her at the end.